Ensure you never miss an issue of your favourite magazine by taking out a great value subscription. 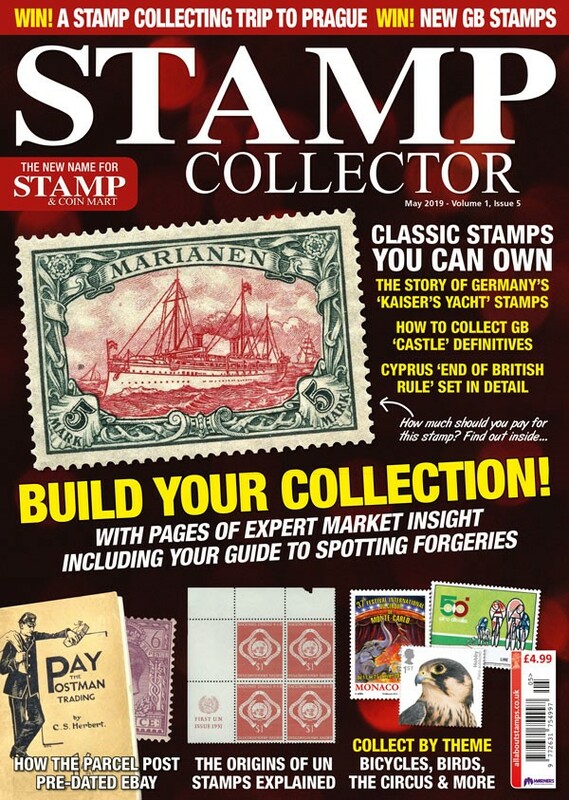 The May issue of Stamp Collector is yet another bumper pack for readers, including the fourth issue of Coin Collector magazine, packed full of coin collecting tips, insight and advice. Inside Stamp Collector we take a look at the early commemoratives you can afford in a special feature that sheds light on some of history’s most beautifully designed and intriguing pictorial stamps. The guide celebrates the story behind these 19th-century stamps and provides tips to help readers add them to their albums. Our popular ‘Celebrated Sets’ series continues with a look at the 1928 Cyprus set that marked the fiftieth anniversary of British rule, revealing the inspiration for the set of ten stamps and giving collectors the latest values; whilst our ‘How much should I pay for…’ regular takes a look at German colonies stamps depicting the Kaiser’s yacht, detailing the varieties of the popular stamp design and recent prices paid. Our extensive thematics guides cover a range of topics, including the Circus, bicycles, birds of prey and the White House on stamps, and we also represent the world of postal history, with a guide to ephemera and mail from Glamorgan and another fascinating ‘cover explained’. For GB collectors we conclude our two-part guide to GB ‘Castles’ high values, preview the new ‘Birds of Prey’ special stamps from Royal Mail, and take another trip ‘around the islands’ previewing the latest stamps from Jersey, Guernsey, and the Isle of Man. With a quick guide to Turkey stamps, the story behind United Nations stamps, and another reader’s exhibit featured in ‘Stamp Showcase’, the May issue is another must-read for collectors, giving readers the information, inspiration and market advice to build their collections. All this, and it also includes an 84-page coin magazine!